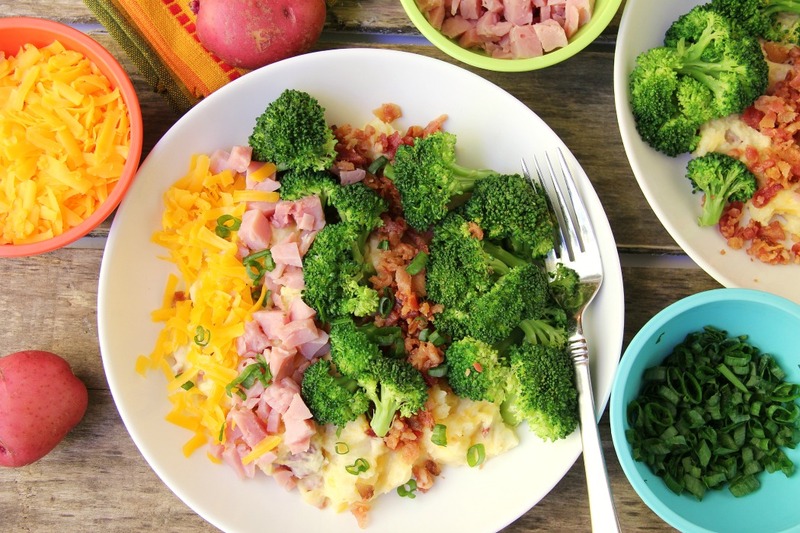 Twice Baked Potato Bowl – Baby reds are steamed, mashed, loaded with delicious toppings and then drizzled with a cheesy broccoli sauce. Tastes just like a twice baked potato, but prepared in record time! Thank you to Side Delights® for sponsoring this post. All content and opinions expressed here are my own. In fact, I’ve been so caught up in party planning that my meal planning has fallen by the wayside. That’s when I rely on my tried and true recipes that take literally minutes to prepare. 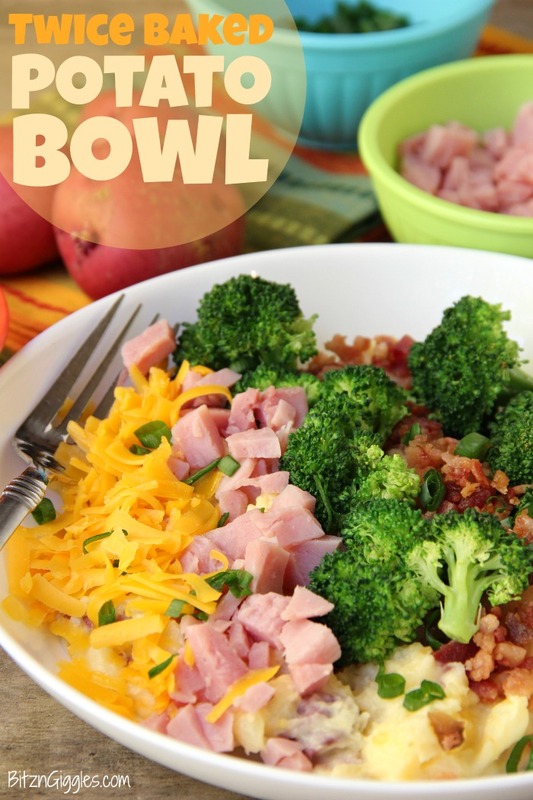 This Twice Baked Potato Bowl is one of them! My favorite part of this recipe are these potatoes from Side Delights®. 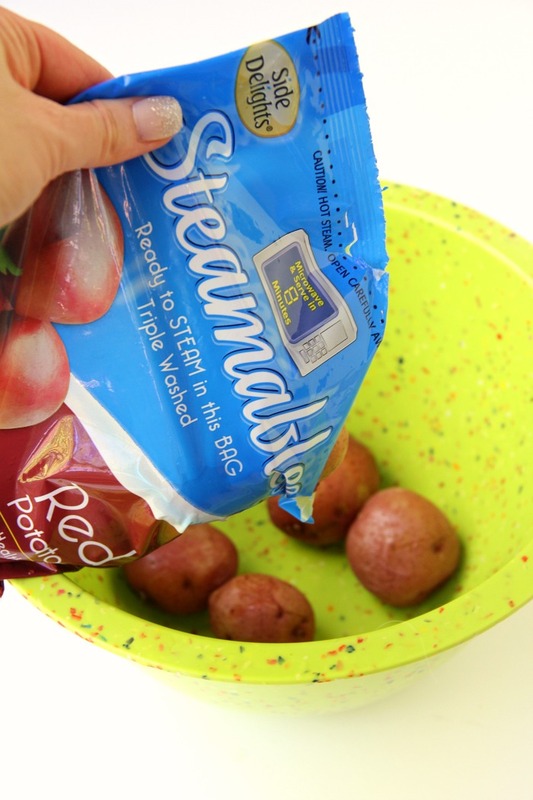 This recipe uses their Steamables™ Red Potatoes, but they have an entire line of different varieties to choose from. You microwave them right in the bag, so there’s no mess or clean up. Oh, and get this. . .they’re ready in 8 minutes! After steaming the potatoes, you dump them right into a bowl. Pretty easy, right? Add some cheese, heavy cream, sour cream and seasonings and you’re on your way to twice baked potato heaven. This recipe makes two larger bowls or four smaller bowls. 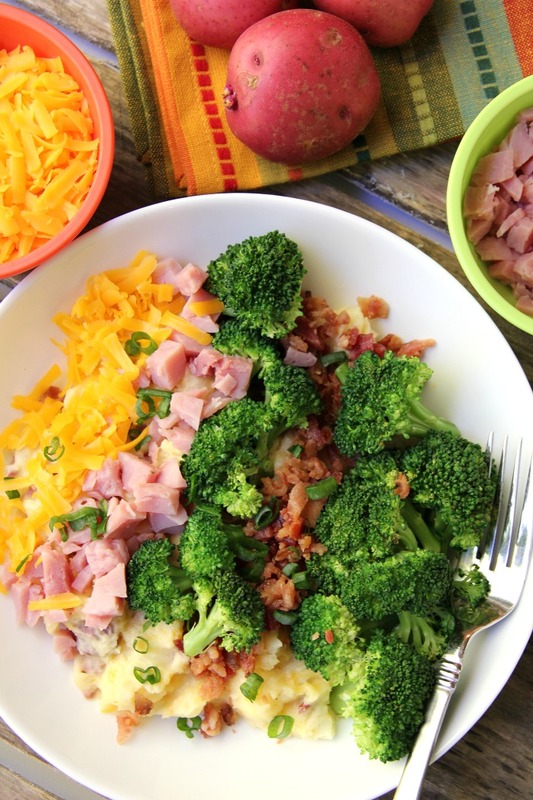 After the potatoes are mashed, I divide them between bowls and top them with freshly grated cheese, diced ham, steamed broccoli, bacon pieces and fresh green onions. Once you mix all of the ingredients together and the cheese gets all melty, it’s oh so good! It’s such an easy and delicious meal. The entire family loves these bowls because you really can top them with whatever you like. It’s really a complete meal! My kiddos have even been known to heat these potatoes up for breakfast and top them with just ham and cheese. 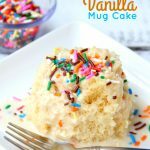 They choose these bowls even over some of their favorite casserole dishes! To take these bowls to the next level, I occasionally add some broccoli cheese sauce. Mmmm. . .yep, that’s what I’m talking about. 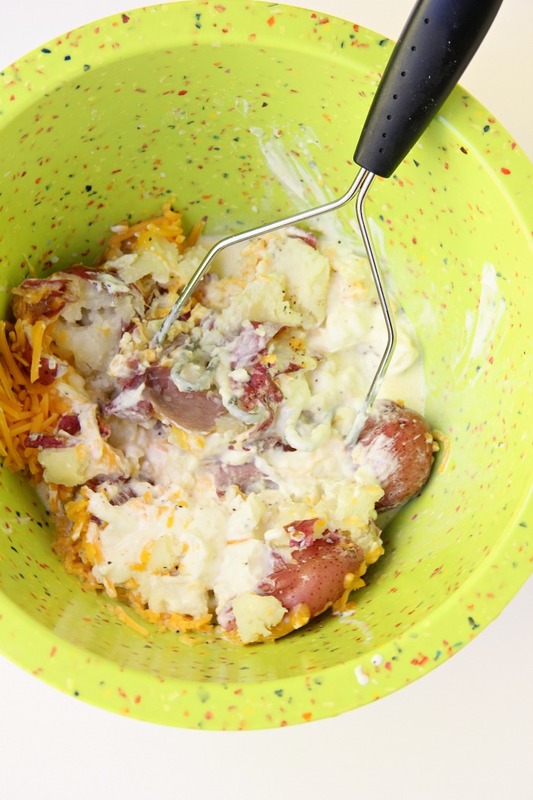 This is my husband’s favorite way to eat this twice baked potato bowl. So, although I haven’t been as on top of meal planning as I should be lately, I’m so thankful for recipes like this that I can throw together quickly and are still fresh and delicious! 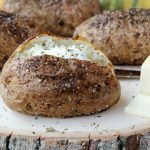 I’d love to hear what else YOU would put in your twice baked potato bowl. 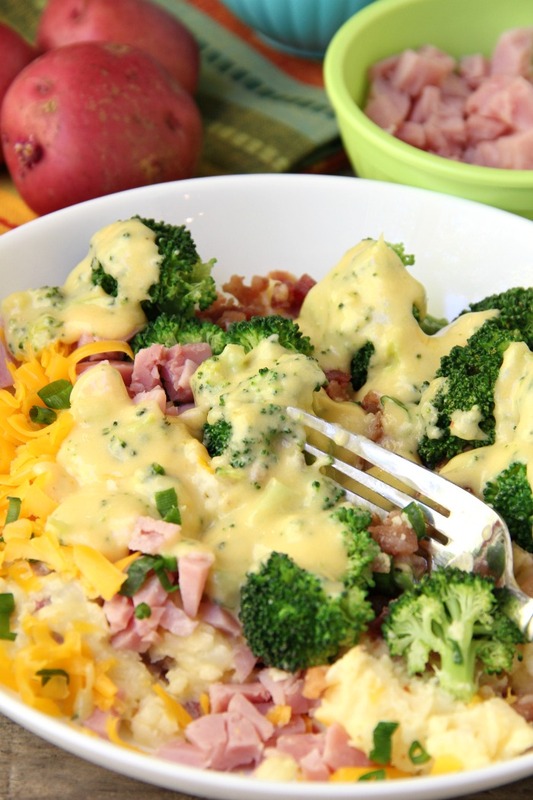 Baby reds are steamed, mashed, loaded with delicious toppings and then drizzled with a cheesy broccoli sauce. Tastes just like a twice baked potato but prepared in record time! Microwave potatoes as directed on package. Transfer to large bowl, add butter, heavy cream, sour cream, cheese, salt and pepper. Mash until ingredients are well combined. Divide mashed potatoes between bowls. 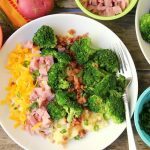 Top with grated cheese, steamed broccoli, ham, bacon pieces and green onions. Drizzle with cheesy broccoli sauce. Stir constantly for 2 minutes or until thickened. Add the cooked broccoli pieces. Recipe makes two larger bowls or four smaller bowls. What a great dinner option! My kids will love it! I hope you try it, Amy! Love this recipe. Many of the ingredients my family would enjoy in a bowl. It definitely is a family-friendly recipe! Wow, this is such a time saver!! Looks delicious! This is just the kind of dinner we need for busy weeknights! Can’t wait to make this! It literally takes minutes, Erin! Such a fun easy meal! 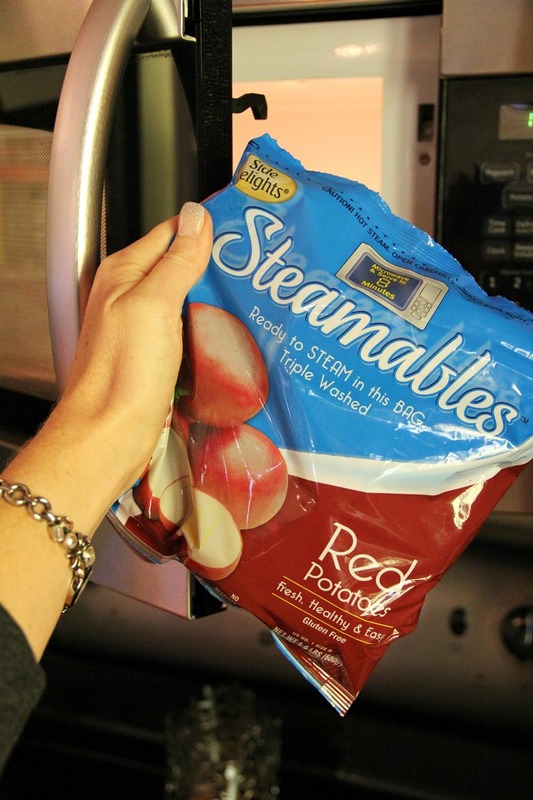 Those steamable potatoes are awesome! I agree! They make meal prep so easy! 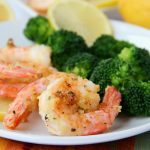 This is really good for all that busy weeknight dinners! And we have MANY busy weeknights! That’s for sure! I love this! Great side option or lunch in my opinion! Thanks, Krista! I often eat the leftovers for lunch! This looks amazing. 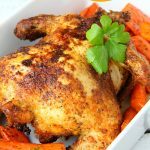 This would be perfect for a quick weeknight meal. I love you blog, I enjoy your posts. I look forward to more amazing recipes! Thank you, Shannon! The whole family enjoys this potato bowl. I hope you continue to come back and visit! !